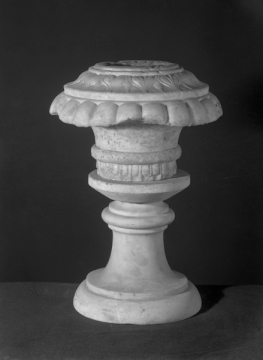 This vase fragment is enriched (from top to bottom as set) with fillet, cyma reversa waterleaf flattened out, convex fluting at overcurl, plain cavetto and a rolled fillet above piped, petalled fluting. It is the upper part of the pedestal of a large marble vase, such as appear in great numbers, both ancient and restored, under the vases engraved in Piranesi's works1. The modern (eighteenth century) pedestal support is similar to those used in restorations of antique fragments by the workshops of Cavaceppi, Piranesi, and their confrères, and glorified in the engravings of the latter. For comparison see the upper pedestal of the marble vase in Piranesi's time at the entrance of the Casino of the Villa Borghese2 and now, with altered lower pedestal (? ), in the Louvre3 and others listed in the note to Soane fragment Vermeule 275 (M1199). Note that since this piece was catalogued by Vermeule the modern pedestal support has been removed. 3 S. Reinach, Répertoire de la Statuaire Grecque et Romaine, I, Clarac de Poche, Paris, 1897, p.119, no. 129 bis. Rome; collected by Charles Heathcote Tatham for the architect Henry Holland during the 1790s. See Cornelius Vermeule, unpublished catalogue of the Antiquities at Sir John Soane's Museum, Introduction, transcription of Tatham letters, List 3, no. 20.